A tasty way to give a gluten-free “breading” to salmon. I thought I had received this recipe from my Aunt Dawna, but when I emailed it to her she said “It’s far different from the one that I make” so it’s origin is a mystery… I didn’t have breadcrumbs and so ta-da! A gluten-free recipe! 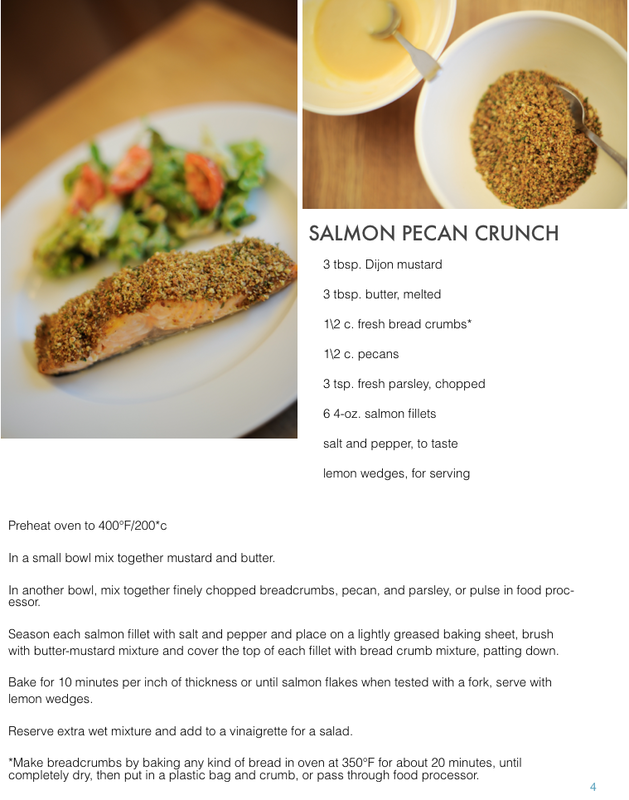 Tags: baked salmon, breaded, crunch, Gluten-Free, pecan, salmon. Bookmark the permalink. Here is a fool proof way to make the best salmon you’ve ever had. Take a chunk of salmon steak or a slice of filet and place on a piece if foil that is big enough to wrap the piece air tight. Add a little olive oil, lemon juice, white wine, a table spoon of capers and and a couple slices of lemon on top. Wrap it all up so the package is air tight and put on a hot grill 450-500 degrees or an oven at same temp for 8 minutes only. Open and serve immediately.